It’s hard to argue that this isn’t the most beautiful car to have ever come from Japan. 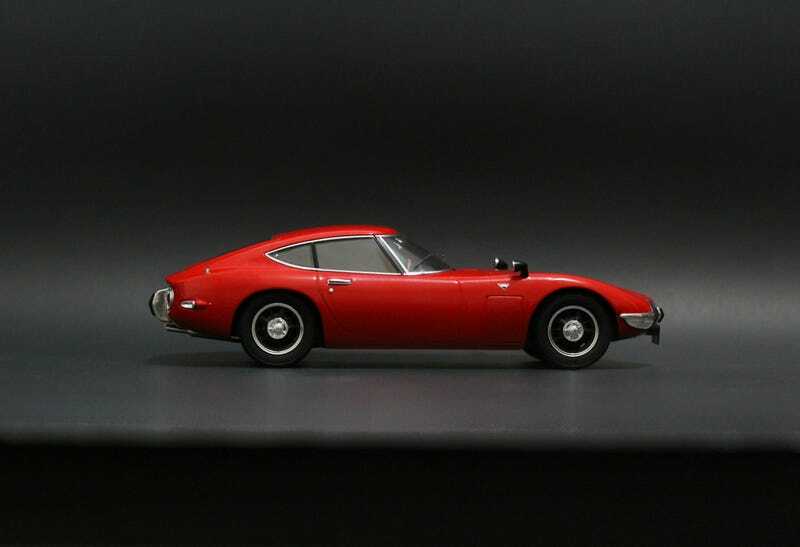 This is the Toyota 2000 GT from the brand Triple9 Collection. It’s a sealed diecast model, so you get high detailed looks of a resin model with the cost and feel of a diecast model. This one was a birthday gift from my wife this year. (I might have picked it out and sent her the link.) American Excellence had it cheaper everyone else, and I chose red over the iconic white paint because the last and only 2000 GT I’ve seen in person was red just like this. Once again, we’ve come to the arguement that no opening features is kind of a disappointment. However, the next step up from this is an AutoArt and commands a pretty penny. If you’re like me and find the design of the car beautiful but you just don’t like JDM cars that much, this model is the perfect solution. The badges, wing mirrors, and interior detail are just about perfect. The most interesting detail about the car though are the wiper blades. They’re actual metal, not molded plastic, and the sit properly on the car’s wind screen. The car is not without faults though. I find the paint a little too thick, which takes away some depth of the casting lines a bit. Both axles are fixed, so both sets of wheels have to turn at the same time. They feel a lot like the plastic snap-on kits I used to make as a kid. The fronts don’t steer either. Lastly, the hinges on the hood are just painted on. Why do through all the trouble to make incredible windshields wipers to just paint two silver strips for the hood hinges? The 2000 GT is gorgeous regardless, and is a worthy contender for the red day crown. Red is an amazing color for this car and the black wheels with matching went mirrors couldn’t look any better.